Process and plant engineers with operations or sub-systems that require, SIL safety, IEC 61508, compliance can now look to the new advanced ST51A and ST75A Thermal Mass Flow Meters from Fluid Components International (FCI) as their solution for air/gas flow measurement. For engineers designing safety instrumented systems, these models are the industry’s most compact, lowest cost thermal flow meters to carry a SIL rating. They were independently evaluated by world leading functional safety experts, Exida, and found to meet SIL 1 compliance. The Model ST51A Flow Meter is an insertion-style instrument designed for use in pipe diameters larger than 51 mm. The ST51A meter is optimized for flow measurement of air, compressed air, nitrogen, natural gas, digester gas and all other biogases. 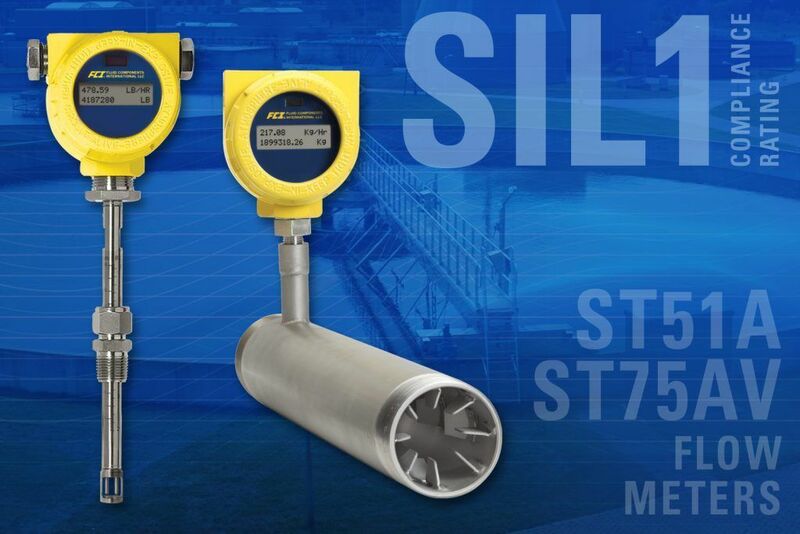 The ST75A Flow Meter is an inline-style instrument designed for use in pipe diameters from 6 to 51mm. The ST75A meter is designed for applications in air, all inert gases, natural gas and other hydrocarbon gases. Both models feature wide 100:1 turndown, have no moving parts, carry global agency approvals for Div.1/Zone 1 Ex installations, superior IP67 dust/water ingress protection and rugged, all metal enclosures. A two-year warranty is also standard. For interface and communications these instrument’s outputs include dual 4-20mA which meet NAMUR 43, HART Version 7, certified by the FieldComm Group™ (HART), and a 500Hz pulse. Optionally available is two-line LCD readout to display flow rate and either temperature or totalized flow. The transmitter/electronics can be integrally mounted with the flow element or remote mounted up to 30m away. Users have a choice of 24 Vdc or 85 Vac to 265 Vac powering. The transmitter enclosure is available in either painted aluminium or stainless steel, and can be ordered with either NPT or metric threaded cable ports. Both the ST51A and ST75A meters are temperature compensated and calibrated to the user’s actual installation conditions in one of FCI’s 19 flow stands using NIST and ISO/IEC 17025 traceable equipment. For applications with limited straight-run, the ST51A and ST75A can be supplied with and calibrated specifically for use with Vortab ® Flow Conditioners.